Ribbon Carousel Blog Hop Time! Well, it seems that I haven't blogged in about a week and a half. What's up with that? Oh maybe it's the one million and one things I have going on right now, along with entertaining the kids for the summer, soccer, along with a fun project of the month about to debut for The Cat's Pajamas, along with creating super cool things for Scrapper's Boutique (I love my job! ), along with Eric throwing his back out, and me not ever getting to the grocery store except to "piece meal" it every day and all that other stuff that happens called LIFE. I've been a little behind for a while now and I really wish I had a few days straight to just CREATE and catch up. The backlog in my head of all the things I want to make is really making crazy (because of course I had to get on Pinterest a few hundred times in between all that busy-ness)! So for me, this card kind of sums up all those things into one, which I wouldn't change at all (except Eric's back problem! He's seeing a doctor today...I bet he has a herniated disc. ); life just goes on and a positive attitude is totally necessary! Anyway, I'm glad ya'll still love me even though I take these ridiculously long hiatuses. Today I am playing along in the Ribbon Carousel Blog Hop. Your Next Stamp is partnering with them and is even offering a lovely coupon code to all blog hop participants for 15% off any online order placed from today through June 30th! You can't beat that with a stick! 1. Hop along and leave some blog love for our designers for a chance to win! 2. 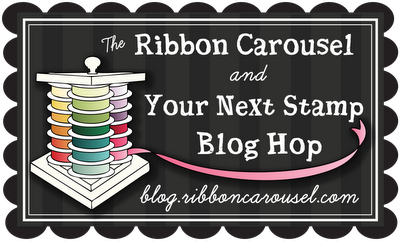 The Ribbon Carousel is giving away a ribbon carousel! 3. Your Next Stamp is giving away a $10 YNS online Gift Card to spend on stamps of choice! I was going to make this card a little more patriotic, but when I started taking the papers out that I wanted to use, it became more "county fair". I even added a vintage ticket (that looks a little like money if you look away and then take a quick glance out of the corner of your eye!). I thought it all went well with the fun red gingham ribbon I was sent from The Ribbon Carousel. I had been itching to use my new Balloon Trio Dies from Your Next Stamp, so I made all of my balloons a little different and then highlighted the background of the cream panel and took the sentiment from the Happiness stamp set. So glad you're hopping with us! Prizes will be selected randomly from comments left on the DT blogs! The more you comment, the better your chances of winning! Hop will run through Friday, June 29 at 11:59pm EST. Blog Hop winners announced Saturday at 8:00 PM EST! SUSIE Q-TIP: My card was a very clean design to begin with, but lacked character. Once I added the ticket (to an almost completed card), it started to come to life. I had already glued everything down, so I to add a little more of a worn look, I just lifted the edges of each panel with my fingernail and made them a little more disheveled. Happiness. I love what you've done! Super fun and cool! Cute card - love how you used the twine as strings for the balloons. This is cute! I love the stitching, and the distressed panels! With the ribbon, it reminds me of a nice country store or a homemade quilt! Love it! What a cool card - I love the balloons on the strings AND the gingham ribbon! I like the county fair feel and the ticket is perfect. It is fresh and country; love the addition of the ticket! Love what you did with those balloon dies. Fabulous card. Fabulous card!! Love the papers you used! What a nice technique curling the paper up. What a great idea! Such a beautiful card. Love all the papers. Gems on the balloons - great idea. This is so fresh and fun! LOVE IT! Hope you find some time to catch up! Love those balloons - they are such a fun touch on this very charming card! Susan, your country fair card is awesome! Love the dsp patterns and those balloon dies too. The gingham ribbon is so sweet and the ticket just added the right touch. Very pretty! !